The Wizard of Wishbringer - "A totally objective, highly critical and unbiased interview with Infocom game designer Brian Moriarty, by Brian Moriarty." Zork Advert, from Byte February 1981.
Review of Zork by Bob Liddil, from Byte February 1981. ANTIC Interview 88 with Dan Horn, technical director at Infocom. Hosted by Randy Kindig, Kevin Savetz and Brad Arnold. "Games With a Real Byte To Them," by Gary Taubes, published in the March 1984 issue of Discover magazine. 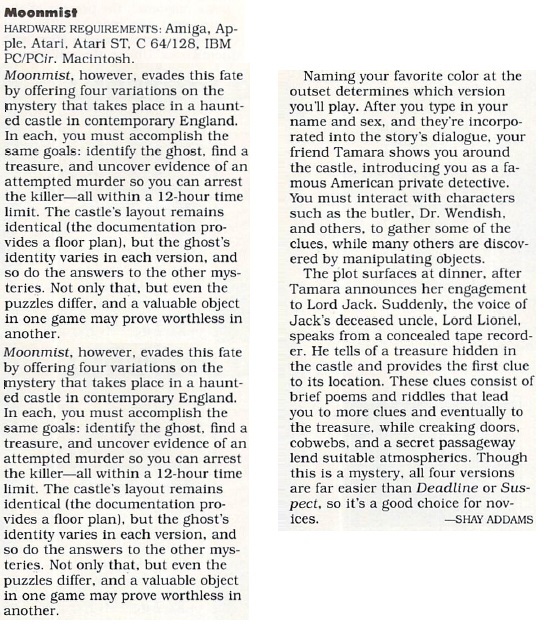 Review of Enchanter, from Ahoy March 1984.
Review of Beyond Zork, from Family Computing April 1988. "Disk Drive Detectives: Make Fiction Come Alive with Mystery Games", by Shay Addams. Features "Deadline," "The Witness," "Ballyhoo," and other games. From Family Computing December 1986.
Review of Stationfall, from Family Computing December 1987.
Review of Trinity, from Family Computing February 1987. 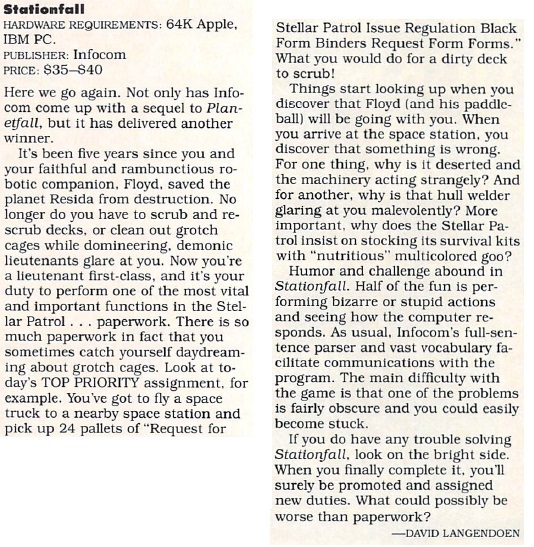 "The Hard-Boiled School of Software: An Interview with Marc Blank and Mike Berlyn of Infocom", from Family Computing June 1984.
Review of Suspended, from Family Computing June 1984.
Review of The Hitchhikers Guide to the Galaxy, from Family Computing June 1985. "Wander Into Wonderland: Adventure Games Take You on a Vacation to a Place as Vivid as Your Imagination." 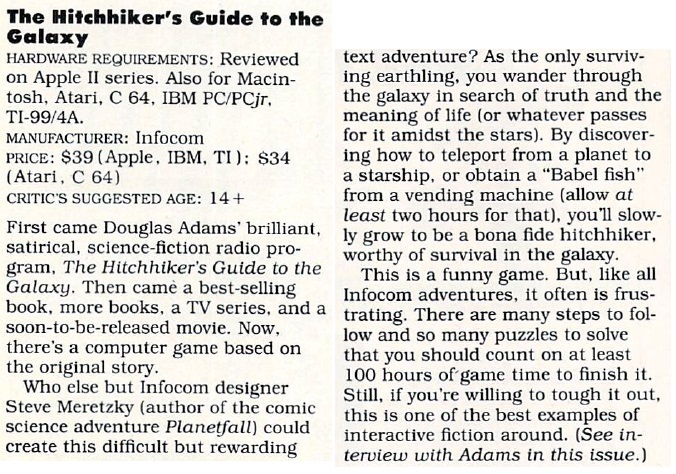 An article about the appeal of adventure games, with an emphasis on Infocom. Also includes a sidebar interview with Douglas Adams. From Family Computing June 1985.
Review of Moonmist, from Family Computing May 1987.
Review of Zork 1, from Family Computing September 1983.
Review of Suspended, from Ahoy January 1984.
Review of Trinity, from Compute! 's Gazette, March 1987. Scanned in by Patrick Kellum.